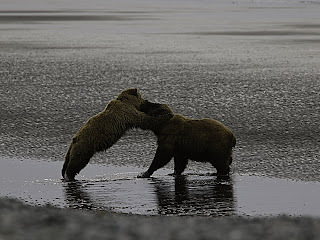 When we first began thinking/planning our trip to Alaska we hadn’t included going to Homer, we also hadn’t given any thought about going to Katmai National Park. 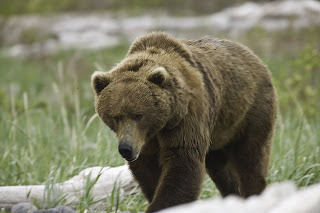 All this changed last year after a very good friend of our came back after spending a couple days with Hallo Bay and told us how great the staff was and how great the bear viewing was as well. So to make a long story short we added Homer to our itinerary and Hallo Bay on our must do list. 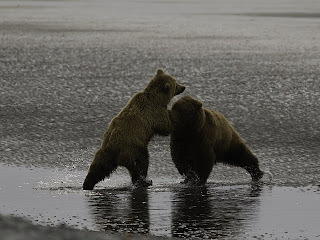 We had a decision to make, do we spend a couple days or take a ½ day trip; we decided on the ½ day trip only because we knew that we’d be in Homer during the later period of our trip (as it turns out today is Day 39). 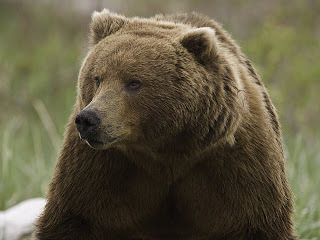 If you only have a short period of time to spend in Alaska and you’d like to see bears (and other critters) up close in the wild (all the while totally safe) environment then by all mean contact Clint and Simyra, owners Hallo Bay. 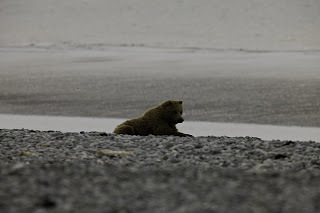 We left Homer a little after 7 a.m. in an aircraft operated by Smokey Bay Air and landed Swik Shak beach in Katmai National Park about an hour’s flight time from Hallo Bay. David, our guide from Hallo Bay took us to an area where several bears had been spotted feeding on a whale carcass the past couple days. 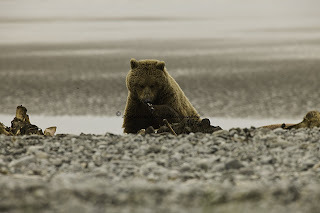 Sure enough we land and find an adult female with two cubs (approximately 2 ½ years old) busy feeding. 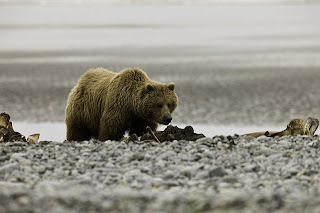 This was a real treat for the bears as they would have normally been feeding on nothing more than grass and the occasional clam however the whale was providing much needed nourishment from their winter hibernation. 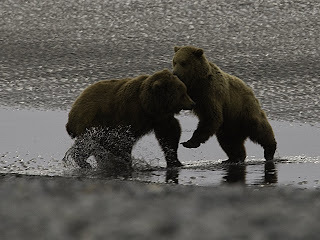 We stayed in the general area viewing the bears for the better part of three hours before returning to Homer. We were very please with the level of security we had while on the beach and our pilot Gary was top gun. 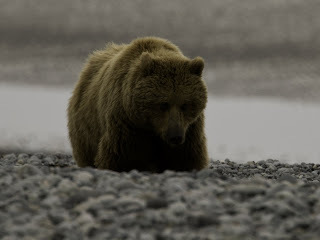 We’re so pleased with our experience from today that we’ve decided several things; we are beginning to plan or return trip to Alaska and we will certainly head straight for Homer, and we’ll be going with Hallo Bay again but the next time will be at their bear camp for several days. 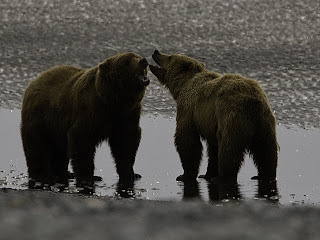 We shot from as close as 25 feet to 50 yards and beyond today; Sandy used her Canon 1Ds III with the 300 f/2.8 and 2x extender while Don used his 1Ds II with a 400 DO and 2x extender. Both systems performed flawlessly. Enjoy the samples – the really good stuff will be posted on our web site after we return home. 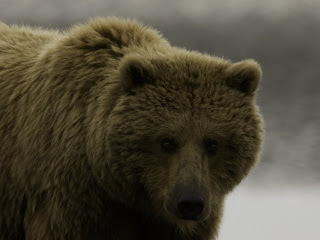 Please note that while the images we post are what we consider samples they are nevertheless are copyrighted by us, Iron Creek Photography and can not be reproduced in any fashion without our consent. You’ll see that we have had to add a small copy right statement on each image in order to better protect our work.